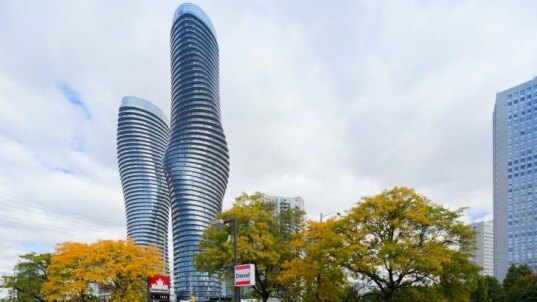 Chinese firm, MAD Architects just completed the curvaceous Absolute Towers in Mississauga, Canada, its first project in North America. 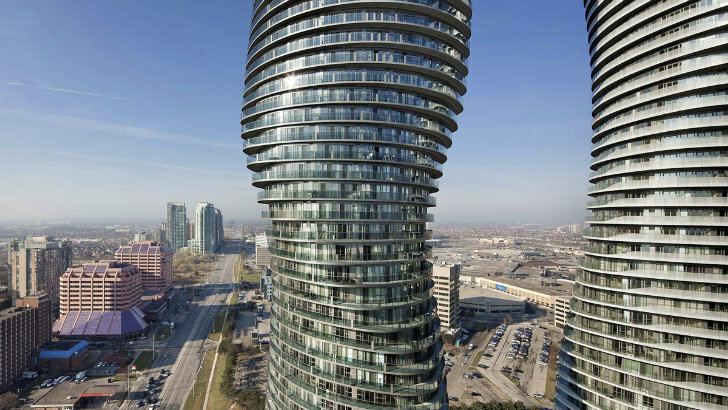 Nicknamed the Marilyn Monroe towers for their voluptuous form, the project serves as residential towers in the quickly growing city just to the west of Toronto. Developed by Cityzen Development Group, the pair of towers emphasize nature and feature 360 degree balconies that aid in solar passive design as a way to reduce energy use inside. MAD Architects won an international competition to design the towers, which is part of a larger 5 tower development project in the downtown area of Mississauga. The project was aimed to provide important residential space for the city as well as create a landmark tower for the rapidly growing Toronto suburb. MAD Architects didn’t want to build the same old boring boxy tower, so they designed one with a lot of curves. It’s so curvy in fact that locals are calling them the Marilyn Monroe Towers. The curves are created by slightly rotating each floor plate by a few degrees, which alters the profile and gives them their distinct shape. Tower A is 56 stories and 170 meters tall, while Tower B is 50 stories and 150 meters tall. Nature also play an important role in the design of the towers and MAD wanted each resident to have access to nature through their views. Balconies encircle the building on every floor and provide additional living space for residents. Natural ventilation and daylighting reach in through operable windows and doors and the floor to ceiling glass exterior. The wide balconies work to aid in solar passive design – shading the interior in the summer and letting in warm sun during the winter, which helps reduce the energy load for cooling and heating. MAD Architects won an international competition to design the towers, which is part of a larger 5 tower development project in the downtown area of Mississauga. The project was aimed to provide important residential space for the city as well as create a landmark tower for the rapidly growing Toronto suburb. MAD Architects didn't want to build the same old boring boxy tower, so they designed one with a lot of curves. It's so curvy in fact that locals are calling them the Marilyn Monroe Towers. The curves are created by slightly rotating each floor plate by a few degrees, which alters the profile and gives them their distinct shape. Tower A is 56 stories and 170 meters tall, while Tower B is 50 stories and 150 meters tall. Nature also play an important role in the design of the towers and MAD wanted each resident to have access to nature through their views. Balconies encircle the building on every floor and provide additional living space for residents. Natural ventilation and daylighting reach in through operable windows and doors and the floor to ceiling glass exterior. The wide balconies work to aid in solar passive design - shading the interior in the summer and letting in warm sun during the winter, which helps reduce the energy load for cooling and heating.